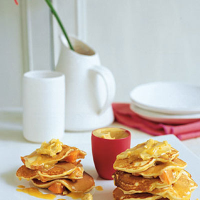 These little pancakes make a wonderful late breakfast or leisurely weekend snack. Serve hot and sizzling from the pan so the sweet maple butter melts all over them. To make the maple butter, beat together the butter and icing sugar with a hand-held electric whisk until smooth. Gradually beat in the maple syrup until soft and creamy. Transfer to a small dish. To make the pancakes, chop the apricots into small pieces. Place the flour and sugar in a bowl and make a well in the centre. Break the eggs into the well, add half the milk and whisk, gradually incorporating the flour to make a smooth batter. Stir in the remaining milk and the chopped apricots. Heat a heavy-based non-stick frying pan or griddle and brush with a little oil. Add 3 tablespoons of the batter to the pan, spacing each spoonful well apart so they can spread a little (the pancakes should be about 8cm in diameter). Cook gently for 1½-2 minutes or until bubbling and golden on the underside. Flip over with a palette knife and cook for a further 1 minute. Transfer to a warmed serving plate and repeat to make 12 pancakes. Stack the pancakes on serving plates and serve, spread with maple butter. Don’t waste any leftover maple butter - it'll keep in the fridge for several days to serve with hot waffles or baked bananas.